The Desjarlais S.D. #1779 was established on March 11, 1908. It was comprised of the following lands: Sections 33-36 inclusive in township 56, range 14; sections 1-10 inclusive, 16, 17 and those portions of sections 11, 12, 15, 20, 21 and 29 lying South and West of the Saskatchewan River in twp. 57, rge. 14, W. of 4th. The senior trustee was Thos. Strenatka of Desjarlais. On March 26, 1910 the following lands were added: sec. 26, 27 and 28 in same township. On April 5, the same year, the district borrowed eight hundred dollars for the purpose of building and furnishing a school. The treasurer was Wm. Hawreliak of Shandro, Alberta. On June 28, 1910 a site was selected at S.E. corner of section 4, in twp. 57, rge. 14, W. of 4th. 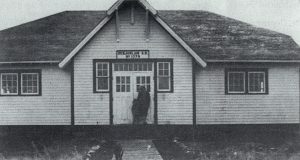 The one room school was built and classes began. During the next few years lands were withdrawn or added. A serious problem existed in that the school was not centrally located so that the children living near the river had some four miles to walk to school. In 1925 the school burned to the ground and a new school was to be built. In the interval classes were held in a farm house. The ratepayers working with the Department of Education through O. Williams, who was the school inspector and the official trustee, agreed to divide the area into two school districts to be named Desjarlais and Deep Lake respectively. On Aug. 14, 1926 the district borrowed the sum of five thousand dollars in order to build and equip a two-room school, a teacher’s residence and a barn. The treasurer was Wm. Karbashewski, of Desjarlais. The site selected was a parcel of three acres situated on S.E.Vi, 9, 57, 14 W.4th. More lands were added or subtracted. The buildings were put up and classes were held for many years in the Desjarlais School. In 1938 the school district was integrated into the Two Hills School Division. On December 29, 1950 approval was given for the sale of all the school buildings situated on the site. The pupils were vanned to the neighboring Willingdon School. On November 16, 1965 the school site was put up for sale and only the memories were left.